So, a little late (but better than never I suppose) and I’m here with a brief tactical look at Korea’s 0-1 to Sweden in the opening World Cup match. Disaster from the start? Not exactly, but it was a match that Shin Taeyong sought to minimize Korean weaknesses rather than play to our strengths, which in the end did us in. So despite the relative success of the 4-4-2 that Korea has enjoyed under Shin Taeyong, the manager opted for an (on paper) 4-3-3 set-up that set up a safer system that sought to balance (again on paper) Korea’s ability to attack Sweden and defend against Sweden’s normal tactics. Kim Shinwook got the nod for his physical size and presence. The three-man midfield allowed Ki Sungyueng to drop deeper to help start moves and to provide some extra cover for the defense/pick up Forsberg should he drop into the middle. This allowed the fullback to stay wide rather then having to track in leaving space for the opposition fullback to exploit (given Hwang Heechan and Son Heungmin’s relative lack of defensive discipline). One of the issues with trying to use pictures for analysis from TV is that you can rarely see the full pitch and all the players when they are spread out, so we’ll have to try and make do with multiple images from relatively small time window (the two above are 8 seconds apart). 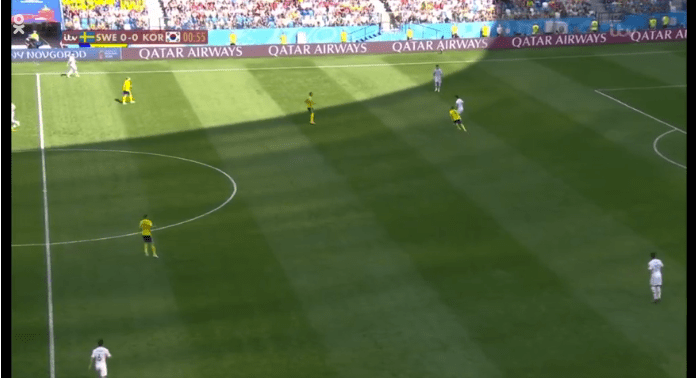 The basic pattern for the early going when Korea had possession was for Sweden to apply situational pressing, but to largely stand off when Korea had the ball within their own half. Ki Sungyueng regularly would drop deeper to help pick up the ball and start moves with the centerbacks splitting wide and the fullbacks pushing higher. 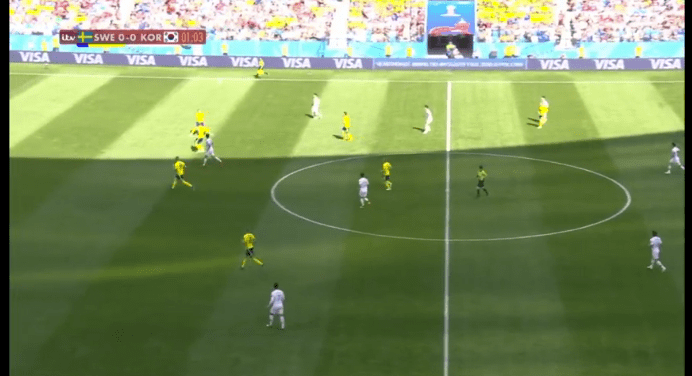 Sweden played a 4-4-2/4-2-2-2 when without the ball, and kept their shape a little on the narrow side to prevent Korea from playing through the center. Sweden’s wide midfielders usually left Korea’s fullbacks open to receive passes, but would press them when they received and force turnovers or a backpass. Both Park Jooho (later Kim Minwoo) and Lee Yong lacked the individual ability to beat Forsberg and Claessonto open up space and passing options. 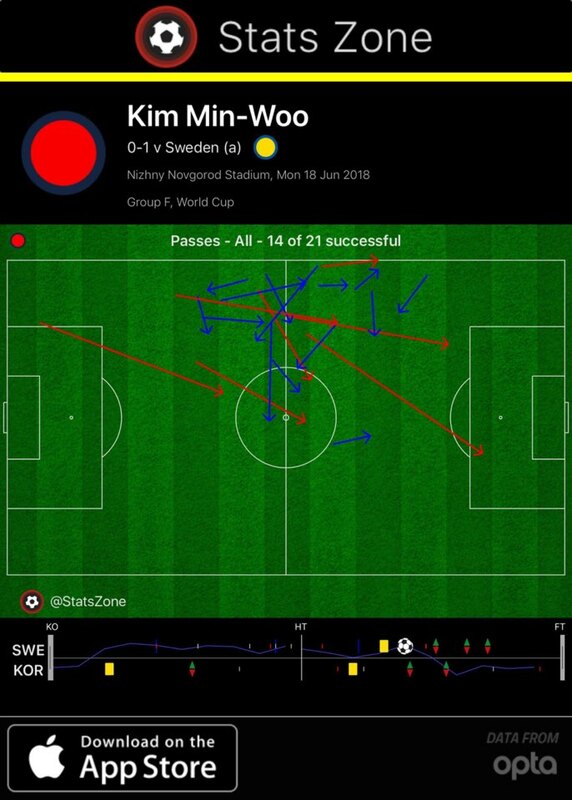 The result was largely that Korea ended up going direct and playing long, direct passes from the back to Kim Shinwook, and then trying to win the second ball. This was a very hit-or-miss tactic as it tended to rely on the individual brilliance of Hwang Heechan and Son Heungmin to then make something happen on their own do to Korea’s slightly spread nature and that Sweden’s set-up allowed them to easily collapse on players with the ball. Korea’s better chances/moments tended to come from counterpressing as they could recover the ball before Sweden had a chance to set their defensive shape. However, do to the referee’s quick whistle (43 fouls total, 23 on Korea) pressing became hit-or-miss as meaningful pressure often led to fouls being given. One of the more disappointing aspects of Korea’s plan was their defensive set-up. While they (as mentioned above) occasionally applied pressure well higher up, they largely opted to sit deeper. Allowing Sweden to advance to the halfway line or just into Korea’s half until starting to apply pressure. This approach can be successful, but it requires intelligence in terms of either A) launching counterattacks or B) building out from deep areas under pressure. Korea did neither well and the end result was the team simply clearing the ball right back to Sweden’s defenders or out to touch. Sweden was then able to push Korea further back with successive attacks further compounding Korea’s problems. While both Korea and Sweden sought similar defensive ideas (situational counterpressing, defending own half), the formational set-ups were very different. Sweden staggered their forwards and midfielders to create effective pressing situations using the touchlines. Korea simply created two defensive lines to defend scoring chances from central positions. 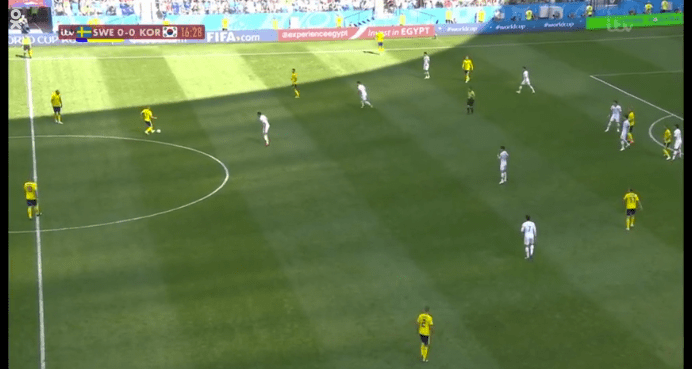 Korea was unable to apply any consistent pressure on Sweden’s passers due to the fact that Lee Jaesung and Koo Jacheol were forced to stay deep to honor the threat of Forsberg and Ekdal, leaving any pressing to the attacking three of Kim Shinwook, Son Heungmin, and Hwang Heechan, but a 3 v 6 pressing situation is always a losing proposition. The result was that Sweden’s defenders largely had free reign to pick out their long passes to the center forwards. The two banks of defensive lines did largely do their job. Sweden didn’t have too many clear cut chances other than Berg’s chance early on in the first half. xG, while not a perfect statistic, does well though to show that this was not a game full of opportunities for either side. Michael Caley’s model (@Caley_graphics) gave Sweden 0.8 xG (+1 penalty) while 11tegen11 (@11tegen11) gave Sweden 1.63 (penalty included). Clear cut chances were few, which is what, given the players and Shin’s post-game comments, what Korea was aiming for. When reports of Kim Shinwook’s inclusion started filtering out of the Korea camp, most had a reaction featuring a mix of horror, frustration, and disgust. I, in full disclosure, had a much more muted reaction. Kim Shinwook’s failings are well-known, and it’s clear that the Sweden camp did their homework extremely well on him. 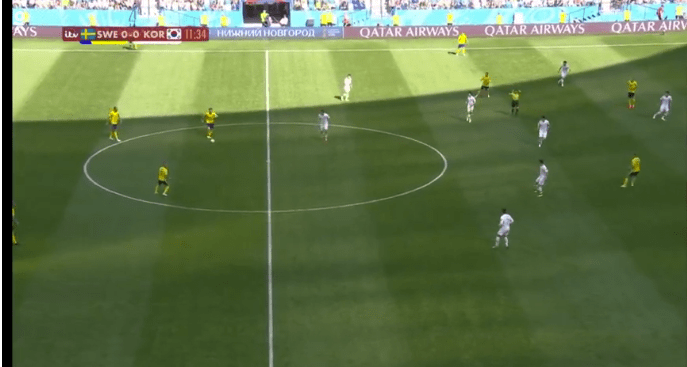 But, when you consider that Sweden played basically exactly as expected (see Tim Lee’s excellent tactical preview of Sweden here), Kim Shinwook’s inclusion was pretty much a given. It is nice to think that if Shin Taeyong had played the 4-4-2 with Lee Seungwoo on the left flank that Korea would have played this dynamic game full of pretty passing patterns, but that seems unlikely. Likely what would have happened is that Lee Seungwoo would have been isolated down the left, trying to cross the ball into the box for Son Heungmin and Hwang Heechan – both while great players, are not particularly good in the air (see Hwang’s miss at the end of the match). Lee Seungwoo also would have been a bigger liability defensively and perhaps would have needed one of Son or Hwang to drop back deeper to help out. The truth is that there was no ‘perfect’ formation/tactical idea for Korea due to the team’s weaknesses and Shin Taeyong’s player selection for the squad. A 4-4-2 with Ko Yohan at right midfield and Lee Jaesung on the left (Son and Hwang up top) could have had a little more balance in it, but central midfield will always be a problem as Ki Sungyueng is a must include, but his partner remains problematic. Koo Jacheol struggled again, and Jung Wooyoung still fails to inspire. A 3-4-1-2 with Kim Shinwook at the 1 and Son and Hwang playing a two-top system is intriguing on paper, but the system is unfamiliar to the players and would require excellent communication and covering between the wingbacks and the three centerbacks to mark the Sweden center forwards and pick up the runners coming from midfield (this was a problem for Korea even in their defensive 4-5-1 shape). Lack of individual quality matters at major tournaments. Son Heungmin was pretty easily the most talented player on the pitch, but the tactical set-up negated any real chance for him to showcase that. With Son out of the picture, Korea’s lack of talent in other areas was obvious. The midfielders lacked the technical ability to create space on their own and were forced into backwards and side passes. With the midfield going nowhere and Kim Shinwook up top, the defense ended up going route one early and often. If you haven’t gotten the memo yet, FULLBACKS ARE MASSIVELY IMPORTANT IN MODERN FOOTBALL! With wide midfielders almost always being inside forwards these days, fullbacks must be able to provide width and some attacking spark while also being defensively solid. Korea’s fullbacks were poor (and Park Jooho was injured early) and teams know it. Lee Jaesung must do more to assert himself on matches. The Jeonbuk midfielder has oodles of talent, but he often remains too passive for my liking. This match desperately needed him to help relieve pressure in midfield with Ki Sungyueng deeper, but for various reasons that never happened. Whether at this World Cup or after, Korea MUST choose a system to play and work to PERFECT it as much as possible. Yes, it will have weaknesses for other teams to exploit, but I struggle to think of any other international side that tries to be as tactically-variant as us and is successful. I’ve said it a few times on various platforms, but Korea needs to be Korea and play to our strengths rather than trying to massively compensate in other areas. I had basically the same analysis while watching. It was frustrating to see how Sweden would pressure up high and the lack of skill made the fullbacks try long passes which ended up to Sweden. Also, Korea had zero ideas on how to get Son more involved. He was a ghost for most of the game. Poor managing, but the defense really showed how amateur they are. Lacking a lot of discipline. Terrified to see what the Mexico attack is going to do to them. I guess he’ll get his chance to challenge his idol next week! I’ve been watching a lot of highlights from korean international friendlies from 2015-17…it seems like our attacking “prowess” has dwindled more and more for some reason. No chemistry and we lack any type of dangerous build up play ending in a shot at goal. Can anyone tell me how the team’s performance against Colombia just disappeared?